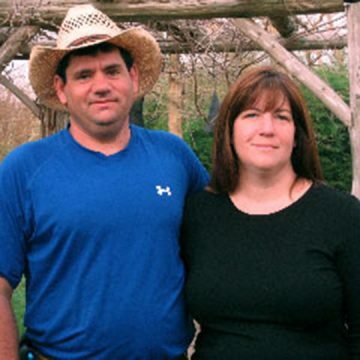 In 1992, Krista and Rob Rahm purchased a farm in Louisa, Virginia, with the desire to raise their children with a close connection to nature while respecting seasonal living, and knowing the value and health benefits of producing their own food. The Rahm family began the journey to make their farm sustainable by growing fruits and vegetables, raising animals for their meat, and growing and cultivating herbs for healing. After many years of learning to live in harmony with the land, studying with medicinal herbal mentors, and making farming their full-time occupation, the Rahm’s began a new mission to educate people about Whole Living by supplying products and offering classes to support their mission. At Forrest Green Farm, they offer educational classes, over 400 varieties of herbs, vegetables and flowering plants, pasture raised chickens, beef, eggs, herbal teas, dips, seasonings, personal care products, naturally grown hay and registered Miniature Hereford cows. During the winter they utilize their greenhouses for a winter CSA of specialty greens and salad mixes.